The relative strength of the U.S. economy came through in higher-than-expected construction spending in September. The Commerce Department reported that spending on residential building rose 17% from the year before, led by multi-family housing. Even though non-residential construction spending declined slightly from August, it grew 12% from September 2014. 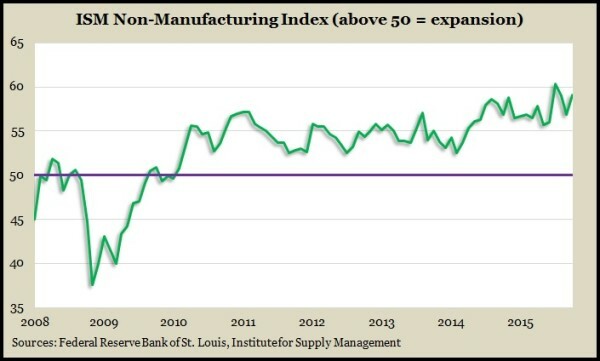 Factory work kept growing in October for the 34th month in a row but only barely, according to the Institute for Supply Management’s manufacturing index. The index dipped to its lowest reading since May 2013 as a slumping global economy and the strong U.S. dollar have been hampering U.S. exports. Although new orders and production grew at a faster pace, the export component of the index contracted for the fifth month in a row. Further evidence of the weakness in manufacturing showed in a bigger-than-expected drop in factory orders in September, the 11th decline in 14 months. The Commerce Department reported that contracted sales with manufacturers fell 7.2% from the year before. Orders for non-defense capital goods excluding aircraft – an indicator of business plans to invest in themselves – went down for the second month in a row and were 4% lower than in September 2014. With dealer incentives, low interest rates and cheap gas, motor vehicles sales reached an annual pace of 18.2 million cars and trucks in October – the highest rate in more than a decade. AutoData Corp., reported that sales were 10% ahead of their pace a year ago, another sign of momentum for the U.S. economy, which relies heavily on consumer spending for growth. Trucks sold at a brisker pace than cars, helped by low gas prices. Imports outpaced U.S.-made vehicles, a function of the stronger U.S. dollar making imports cheaper. The gap between U.S. exports and imports narrowed in September, following an August trade deficit that was even wider than the government initially estimated. U.S. imports of oil continued to decline, helping to lower imports by 1.8%, according to the Bureau of Economic Analysis. At the same time, exports from U.S. companies rose by 1.6%, which should boost overall economic growth. The Institute for Supply Management’s non-manufacturing index rose in October to a higher level than analysts expected. It marked the 69th consecutive month of expansion for the economy’s largest sector, one more reflective of domestic conditions. Business activity, new orders, even export orders all grew faster. The hiring component of the index rose to one of its strongest levels ever. The moving four-week average for initial unemployment claims rose for the first time in eight weeks, inching up from the lowest level since December 1973. According to data from the Labor Department, new jobless claims have stayed below the 48-year average since early 2013, suggesting that employers have been persistently reluctant to let workers go. U.S. productivity increased at a slower pace in the third quarter as output rose while hours worked fell for the first time in six years. The Bureau of Labor Statistics said its preliminary estimate has productivity slowing to 1.6% annually from a 3.5% rate in the second quarter. In the latest 12 months, productivity gained just 0.4%. In that same period, labor costs grew by 2%, lower than analysts expected. U.S. employers added more jobs in October than analysts had forecast, possibly signaling a level of sustainable economic growth that could encourage the Federal Reserve board to raise short-term interest rates closer to normal. The average hourly wage rose 2.5% from the year before, according to the Bureau of Labor Statistics. If maintained, such raises eventually could fuel consumer spending – as well as inflation. The unemployment rate sunk to 5% for the first time since April 2008. Student loans and car financing fueled a record rise in consumer credit in September, according to the Federal Reserve. Outstanding credit increased by $28.9 billion from August, the biggest jump in 74 years of data. Credit card debt increased for the seventh month in a row, a sign that consumers are weighing their appetites for shopping against their willingness to risk more debt.